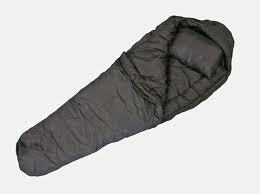 There are many good sleeping bags on the market. A good one can be a bit on the expensive side, but how much is a good night’s sleep worth? I am using the US military 4-Part Modular Sleep System, a bit on the heavy side, but I am not planning to carry it far. It covers form 50 thru -30 degrees. I have found it comfortable and it can be purchased reasonably. Goose Down is more expensive, lighter, compresses easier, warmer by weight, more durable and long-lived. However, if it gets wet, it is useless. In extreme cold, your body releases moisture as you sleep, so a down bag can get wet from the inside even when it is protected from the outside elements. Some of the newer insulations such as Lamilite or Polarguard 3D will keep you warm when wet. Check the stitching; the tubes should overlap so that the stitching does not go all the way through the bag wall creating cold spots. Make sure the bag has a sturdy zipper and a draft tube along the entire length of zipper. Consider an outer Gore-Tex or other water repellant shell for your bag. However, be sure that the shell you purchase will breathe enough to allow body moisture to escape. Make sure it will be warm enough for your area of operations. Mummy bags are largely lightweight, the most efficient for warmth and takes less room in your pack. Remember, you may have to carry it. Think about the weight. Whatever type of bag you choose the bottom line is take it out and use it and I mean more than once or twice. The bag that looks and sounds so good in the store may be very uncomfortable. Don’t forget a good pad to go underneath it. Let’s hear from some of you on your experiences with sleeping bags, both good and bad. I often see good quality sleeping bags in garage sales for pennies on the dollar. Electric Panels and How to Turn Off the Power. This entry was posted in bugging out, equipment, Seventy-two hour kits, Shelter and tagged Howard, sleeping bag, US military 4-Part Modular Sleep System. Bookmark the permalink. I have bought the surplus modular sleeping bags for my family (one at a time because of cost). They are worth the cost and weight. Watch out with the old M-1950 mummy bags. If you get one of those make sure it says EXTREME COLD on the bag down at the feet area. DO NOT get the INTERMEDIATE unless you live in a jungle or an area where it is extremely hot all the time. The Intermediates were designed for use in hot climates. But even with the Extreme Cold bags, get a gortex bivy bag from the Modular Sleep System (like in the article) and include a poncho liner inside the bag. The only way we stayed warm with those was wear our Poly-Pros in the bag and placed the bag out of the wind. Otherwise it was a very cold sleep during winter (if you could sleep). Wiggys are also suppose to be great sleeping bags. I personally haven’t used them but I do hear great reviews about them. I loved the military mummy bags but when it wasnt real cold they werent that good and the critters would get me cause i would kick it off when i slept. The new Military multitiered bag is awesome! I used it for about 6months and actually just paid for it on my departure and kept it. I have several cheap bags which are so-so but if you are going to be in IT this is an area to do your homework and not skimp. Pads seem to be more important as I age too.